Product #1270 | SKU EF2428IS | 0.0 (no ratings yet) Thanks for your rating! 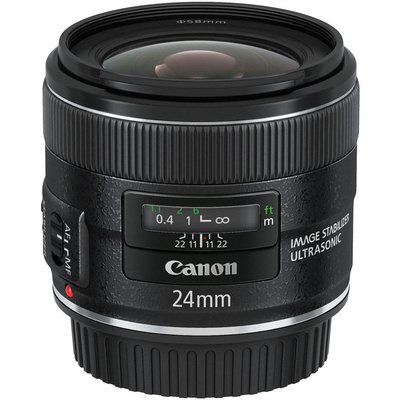 The EF 24mm f/2.8 IS USM Lens from Canon is a wide-angle prime lens that gives you superb image quality in a compact form, it is ideal as an everyday "walk-around" lens. Equipped with Canon's Optical Image Stabiliser, it provides up to 4 stops of shake correction and is effective in low light. A ring-type Ultrasonic Focus Motor (USM) and advanced CPU with optimised AF algorithms provide fast, smooth and silent auto focusing which is especially important when shooting video. Full-time manual focusing is available even while in AF mode. Aspherical lens elements reduce aberrations and help improve image quality on the periphery and Canon lens coatings minimise ghosting and flare. With a minimum focusing distance of 20 cm, the lens can create powerful and inclusive wide-angle images. Image stabilisation enables up to 4 stops shake correction to prevent blur when shooting at slower shutter speeds.